Disclosure: Here at ChiIL Mama we're thrilled to welcome Illumination: Tree Lights back for year 2. And we're excited to partner up with Morton Arboretum on a 4 ticket giveaway. They've also sent us 4 review passes and we'll have a full recap up after we have a chance to check it out. As always, all opinions are our own. Enter ENTER HERE through midnight December 3rd. Passes are good for your choice of dates/times pending availability. This November, 50 acres of vibrant LED lights will once again transform The Morton Arboretum’s treescape into a winter wonderland of color and nature, as Illumination: Tree Lights at The Morton Arboretum returns for its second year. Hailed as a “must-see event” by the media in its debut season, Illumination brings lights and nature together to transform a wintertime walk in the woods into an awe-inspiring experience. From Nov. 21, 2014 – Jan. 3, 2015, walk a mile-long path to marvel at trees illuminated in colors like electric blue, hot pink and neon green and interact with lighted trees that respond to voice or touch. On the Illumination trail, sing to trees to make them change color and hug trees to see how they respond, then warm up at one of our toasty fire pits. Or stop at the warming tent to grab a snack and a warm beverage. Symphony Woods: Enchanting lights dance in synchronized patterns to seasonal music from the renowned Chicago Symphony Orchestra. The popular Tinsel Colonnade will be expanded in 2014 to double its size, as cascades of multi-colored strings of LED lights hanging from the trees like tinsel. More kid-friendly features: 2014’s event incorporates child-friendly elements to engage the whole family, including simpler interactive stations and a scavenger hunt to find the “Glow Man” hidden along the Illumination path for a special prize. More live entertainment: Catch top local bands every weekend during Illumination. Check the Illumination website for the latest schedule. Built in partnership with top experiential lighting designers Lightswitch, Illumination at The Morton Arboretum features energy-efficient, eco-friendly LED lighting. 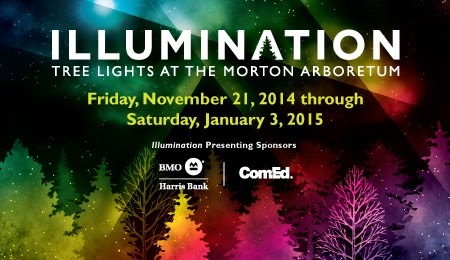 Illumination runs from Nov. 21, 2014 through Jan. 3, 2015. The event opens each night at 5 p.m. and runs until 9:30 p.m., with the last entry at 8:30 p.m. General admission tickets go on sale starting Wednesday, Oct. 1. Members receive an additional discount on tickets purchased between Oct. 1 –31. Tickets are available at mortonarb.org, the Arboretum’s Visitor Services desk, or by calling 630-719-2066 ($5 handling charge for phone orders). See mortonarb.org for updated information on dates and pricing, and follow The Morton Arboretum on Facebook and Twitter for the latest event information. The Morton Arboretum thanks Presenting Sponsors ComEd and BMO Harris Bank for their support of Illumination: Tree Lights at The Morton Arboretum. The Morton Arboretum is an internationally recognized outdoor tree museum on 1,700 acres. Plant collections, scientific research and education programs support the mission to plant and conserve trees and other plants for a greener, healthier and more beautiful world. Designed with natural landscapes, the grounds include the award-winning, four-acre interactive Children’s Garden, the one-acre Maze Garden, plus specialty gardens, 16 miles of trails and nine miles of roads. Visitor experiences include the open-air tram ride, guided walks, Arbor Day celebrations, concerts, art shows, the Fall Color Festival, Illumination and special exhibits. The Arboretum welcomes 885,000 visitors annually and receives support from 38,600 member households. Located 25 miles west of Chicago in Lisle, Illinois, the Arboretum is open daily 7 a.m. until sunset. Learn more at mortonarb.org.